The other day I noticed a Google+ post by a friend (yes, I’m one of the 12 people using Google Plus) about a job board that was launched on the Thoroughly Modern Marketing website. It reminded me that every week or two I get a question about my last post on Job Boards (back in Feb). Here’s the good news – some things have changed in the last six months! When I last wrote about Job Board solutions using WordPress, most of the reviews were of themes. But if you look at the TMMPDX.com site (referenced above) you’ll immediately notice that the job board is only part of the site. So a theme-based approach doesn’t really work well. Unfortunately, most of the folks that build job board solutions decide they need to do it as a theme. I get it. So much of the solution is visual – so I get the motivation. But when you don’t want to run a job board as a separate sub-domain, it makes it pretty difficult to use a theme-based approach. This meant, there was really only one solution for a plugin-based approach. Until recently. 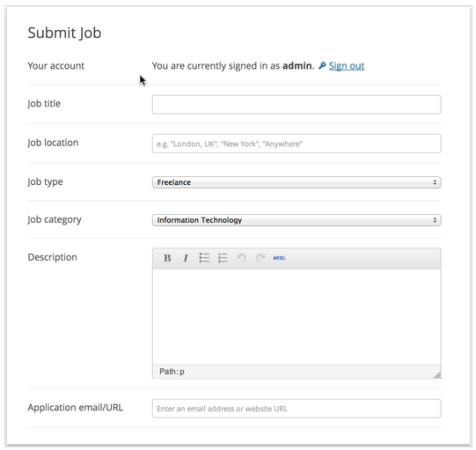 The last time I wrote, I told you about a plugin-based solution called the WordPress Job Board plugin. It’s pretty good and does much of what anyone would want. But now you can choose a different option – one that’s been recently written (and which I’ve put thru its paces): WP Job Manager. If you visit the site, you’ll notice one thing right away – it’s free. But don’t think that because you didn’t spend any money that it’s a piece of junk. It’s a well-written solution that offers tons of powerful features – all for you to leverage in building a job board website in WordPress. It’s developer-friendly. I know you may not care, but if I have to tweak stuff, I want a plugin that is aware that it doesn’t know everything and can’t predict everything I want. WYSIWYG. Most folks approach job board listing creation as a form you fill out. But what will your post ultimately look like. This plugin has a great preview feature I’m sure you’ll like. It’s not overkill. Mike Jolley (one of the WooCommerce developers) doesn’t take over my admin interface with this plugin – which is great. Because I know a lot of other plugins that help turn WordPress into an application platform, but they do so by taking over the entire admin interface. And that scares people. I know a few guys who like to build targeted themes. By targeted I mean they build themes that have a purpose. The difference between these guys and other folks that do similar stuff, is that even when you don’t use that theme for that purpose, it still looks good. So what if you’re building a job board? What theme should you use? Especially now, with WP Job Manager available? My answer is Jobify – a really sharp looking theme. It’s a mobile-friendly (responsive) site theme for WordPress that works well with WP Job Manager, among it’s many features. Now, you’ll have to pay for this theme – $55. But if you recall, that old plugin I told you about was almost twice the cost of this theme. And WP Job Manager is free. So you end up saving money! Does it get better? I seriously can’t think of how. But I can tell you it won’t get easier, faster, or cheaper. So check out this plugin & theme combo and you’ll have a job board website on WordPress in no time at all.